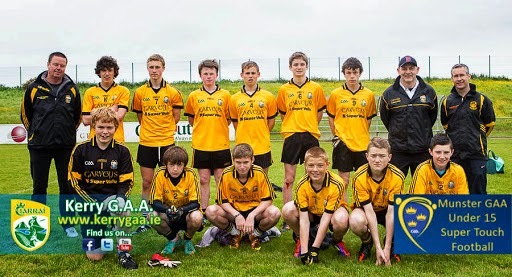 Mallow was the venue last Saturday, June 15th, for the Finals of the Munster U-15 10-a-side Super Touch. Twelve teams from all over the province had qualified from regional groupings held on June 1st. There were four groups of three teams drawn with the top team in each group advancing to the semi-finals. Emmets were in a group with Currow and Ballincollig. Our opening game was against Currow and we emerged victorious in a closely fought encounter with our fellow countymen on a scoreline of 4-06 to 2-08. Our next game against Ballincollig saw the lads put in a great display to overcome the Cork side on a scoreline of 3-08 to 0-03. The excitement was building at this stage for the players, mentors and supporters as the boys were playing great football with a huge workrate being shown by the whole panel. Cork side, Glanmire, were our opponents in the semi-final and another super performance saw us into the final on a scoreline of 2-07 to 1-05. The final against Gneevguilla was a fantastic game with both sides giving their all. We were two points to the good at the small whistle 0-05 to 0-03 and despite tiring bodies on both sides there was no let up in the intensity and the scores were tied at 5pts a piece with four minutes to play. A goal for Emmets at this point looked like it would be enough, such was the passion with which they were playing but credit to Gneeveguilla they kept playing to the end and reduced the deficit to 2pts with over a minute to play. Once again, 2pts proved to be the most dangerous lead, when, with seconds on the clock a shot from 20 yards found its way through a number of bodies to the net and the final whistle blew on the kick-out. Heartbreak for our boys who had left all they had on the field, which is when it always hurts the most but they can be extremely proud of themselves - the twelve players were outstanding to a man over the course of the day and to come so close to winning a Munster title lets them know how talented they are and how important it is that they stick together and keep working and their day will come too. We congratulate Gneeveguilla on their great achievement and on bringing the title back to the Kingdom. Well done to Pat O Shea and his aides on the professional running of the event and to Mallow on their excellent facilities, in tricky conditions. Thanks to the parents and supporters who travelled, they certainly got plenty to cheer! Well done to Tommy Sweeney, Nick Roberts and our twelve Laochra Gaeil: Conor Beasley, Niall Collins,Thomas Doherty, Oran Pierse(2-01), Feidhlim Roberts, Tom Melvin(0-05), Bryan Sweeney(4-03), Jack Healy(2-00), John Leahy (0-04), Sam Tarrant Capt. (1-13, 2f ) Robert Smith(1-00), Sheldon Neill.